Connecticut head coach Geno Auriemma leaves the court after a 91-89 overtime loss to Notre Dame in the semifinals of the women's NCAA Final Four college basketball tournament, Friday, March 30, 2018, in Columbus, Ohio. 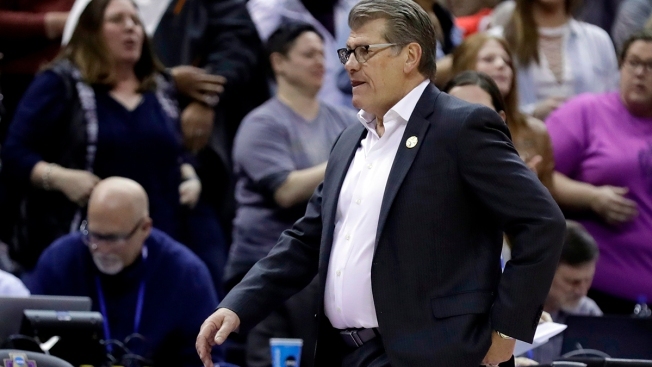 UConn coach Geno Auriemma and the Huskies have dropped two of their last 149 games. "I would say it's hard to believe. Obviously, much harder than the first time," Auriemma said. "Each team had a chance to prove what kind of team they were. There was no backing down either way. Just like last year it came down to one play, one shot. They made it." The defeat ended the stellar careers of seniors Kia Nurse and Gabby Williams. The duo finished with 148 wins — fourth-most in school and NCAA history.